Russellville High School would like to say congratulations to seniors Lauren Gwaltney and Noah Smith on qualifying as a Semifinalist in the 2019 National Merit Scholarship Program. 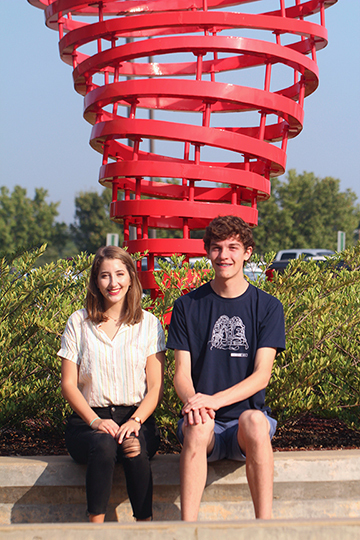 These two seniors were among 16,000 Semifinalists in the 64th annual National Merit Scholarship Program. These academically talented high school seniors have an opportunity to continue in the competition for some 7,500 National Merit Scholarships worth more than $31 million that will be offered next spring. To be considered for a Merit Scholarship award, Semifinalists must fulfill several requirements to advance to the Finalist level of the competition. Over 90 percent of the Semifinalists are expected to attain Finalists standing, and about half of the Finalists will win a National Merit Scholarship, earning the Merit Scholar title. National Merit Scholarship winners of 2019 will be announced in four nationwide news releases beginning in April and concluding in July. These scholarship recipients will join some 338,000 other distinguished young people who have earned the Merit Scholar title. Merit Scholar designees are selected on the basis of their skills, accomplishments, and potential for success in rigorous college studies, without regard to gender, race, ethnic origin, or religious preference.